Ragam Tanam Pallavis are the most important part of a Carnatic Music concert. It is easily the most difficult and demanding aspect of a concert but equally, it gives the freedom to musicians to demonstrate their skills, their understanding and their creativity. For those unfamiliar with Carnatic Music, I have written a very short description of RTP structure in the footnote. RTPs being of 40-50 min duration in a normal concert, I have not attempted to present them in this blog so far. However, I listened this morning to a very nice 12 min RTP which I present to you today. Abhishek Raghuram is one of the young Carnatic vocalists whom I admire very much. I find his music to be both aurally and intellectually interesting and I am certain that he will go on to have an illustrious and well-applauded career in the years ahead. The Pallavi is by T.N.Seshagopalan. The RTP is in Raga Kalyani (click here to know more about this raga). This is from the very recent Margazhi Maha Utsavam concert on Jaya TV on 30 Dec 2011. This is purely improvisational music, the only exception being that the words of Pallavi. The first section, Ragam Alapana, is a leisurely description of the Raga in all its hues ie. it is pure melodic improvisation within the rules of the Raga. This is not accompanied by percussionists. The second section, Tanam, is the rhythmic exploration of the Raga in Madhyamakalam (middle speed) and rarely in Dhuritakalam (fast speed) as well. Tanam phrases are built by the musician using syllables such as ‘aananda’, ‘nam tom da’ etc. which have no innate meaning. This section may or may not be accompanied by percussionists. The Pallavi is a short composition of one or two lines set to an interesting Talam or rhythm which may be composed by the performer himself/herself. The Neraval for the Pallavi is the exploration of the composition using different musical phrases highlighting the lyrics. The Kalapana Swarams are pure musical phrases using only the notes (no lyrics) sometimes interspread with the Neraval. They are always sung in the basic raga but once that is done, the musician may launch into a Ragamalika (a garland of ragas) with Kalpana Swarams in other ragas which are selected to enhance the basic one. Abhishek Raghuram is my favourite amongst the youngsters, he is very talented indeed! The RTP by Abeshik is very good. In the olden days i heard people say Madurai Somu and madurai Mani Ayer singRTP for more than 2 hours. 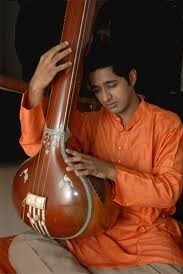 I have heard Karakurichi played in his nadaswaram The raga Kanboj more than 2 hours when i was young. Sangeetha Kalanidhi Madurai TNS sir’s pallavis are aesthetic as well as intellectual and challenging. Sri. Abhishek Raghuram Mama has brought all these aspects of the pallavi properly. Abhishek Raghuram has done an excellent job in this very short RTP, I do admire his skills too! Isn’t it just! This was the first time I had heard Abhishek – I wrote this post in 2011. He was still a very young man but his talent was just amazing! Haa! I was in search of this pallavi for a long time. This was the first time I heard abishek singing and was instantly in awe with his excellence. So glad u have this piece saved. Can u tell me how to download this one? As I was travelling, I am very late in my reply. My apologies. I think this is available online in youtube. The pallavi is available only on your site when searched online. Will be great if you could help with a downloadable link or the YouTube link since I am unable to locate it anywhere else. I tried the link but both the downloadable link and the listening link lead me to error page. Glad to wait for this if you can help with some other fix.